Here are few photo’s of various construction details. 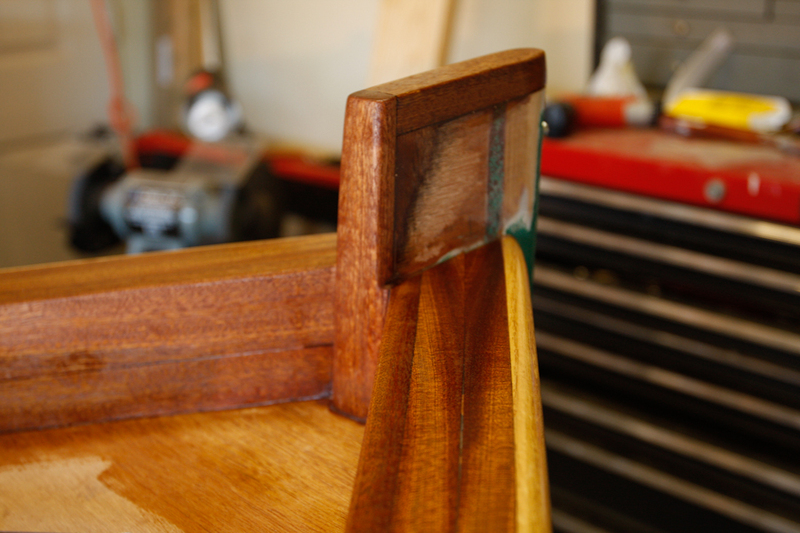 For the stem I added a mahogany trim piece above. Turns out I was a bit short on my stem height after plank attachments. This trim piece brought it back to specifications and also added a bit of beauty to the stem. The mid section will be painted hull green. Here is a view looking aft. 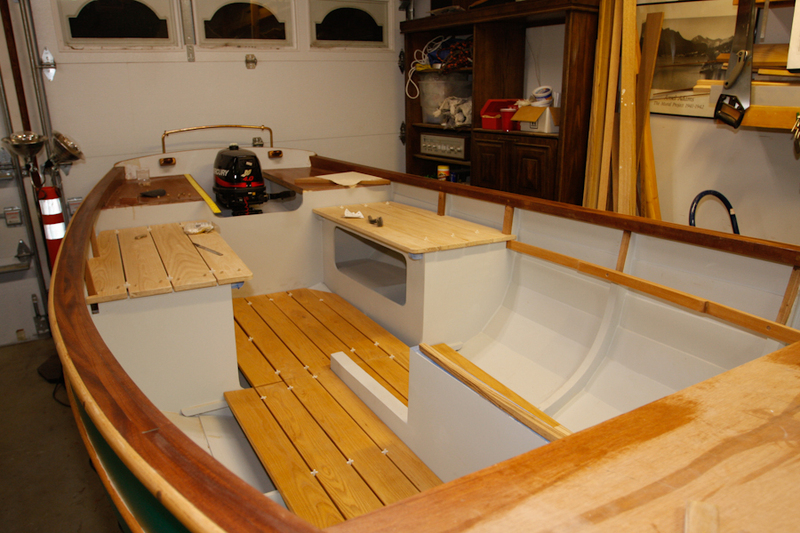 Shows first coat of varnish on the gunwale and the fitting of the floorboards and seats. I used tile spacers to establish a standard width between boards. You can also see the horse traveler and fairleads on the transom. These parts where ordered from Classic Marine. Here is a closer look at the u leads. The length was longer then expected and I had to add spacing blocks. Not sure if this was an order mistake, but I like the results. The bronze horse from Classic Marine is of great quality. 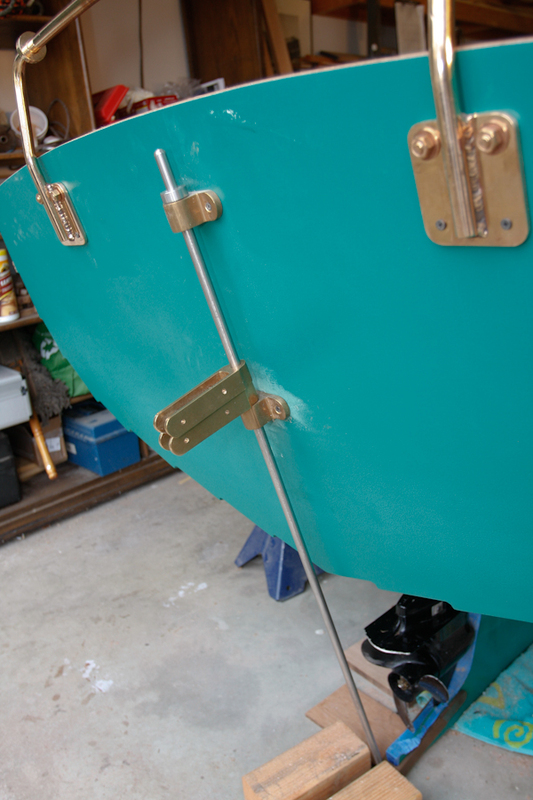 And here is a view of the rudder installation hardware. Very professional job you are doing. When you are finished I hope you post a general idea of the hours in build. I know actual hours building can vary greatly from all of the related activities like …you name it. Keep up the postings and pics…great inspiration to us out here. I started building Alice Gale in September 2009. I am retired and have plenty of time to work on her. I would say I average 20 hours a week. Some weeks more, others less. I haven’t kept specific track of time. A good deal of my time has been either planning the next phase, researching parts and supplies, and a lot of Internet study of “how to” as I progress. I know I could build much faster then I actually am. I don’t have any time restraints, and actually find myself working for a few hours and then simply looking at the boat for another 1/2 hour either planning the next step, or simply enjoying the moment. 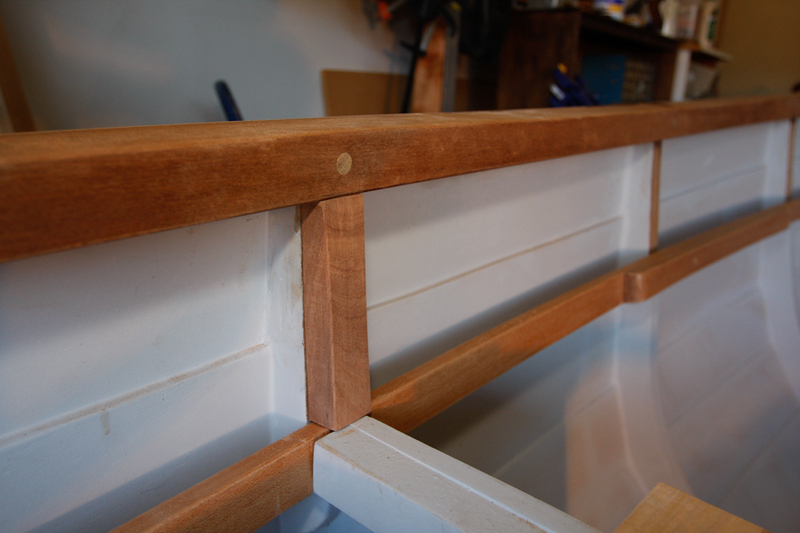 I can’t tell you how many times I have simply run my hand down the gunwale just to feel the wood and imagine in my mind how smooth and bright it will be when finished. Hi Mark. I deviated from plan and made my false stem up from several pieces of oak. Details are shown on a post from early last year. The plans call for a laminated false stem. 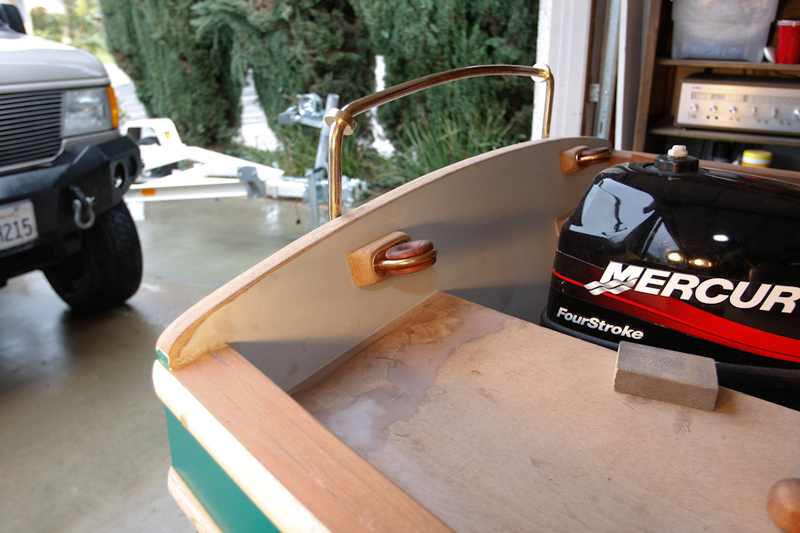 The stem itself is a continuation of the plywood laminations of the keel. 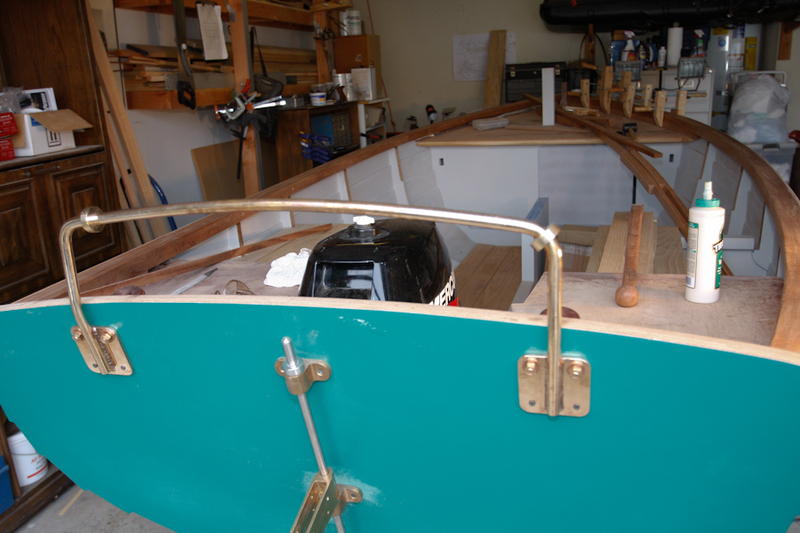 The keel and stem are all one continuous plywood lamination. The full size mylar plans where more accurate then my cuts. Epoxy allows for a significant margin of error so long as you are exact as possible with all your alignments.